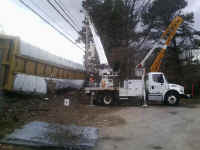 Wyandanch Fire Dep't: Locomotive carrying 2000 gallons of diesel fuel, derailed cut fuel tank, large fuel spill 500+ gallons diesel on the ground. The freight car damaged in the incident is property of the New York and Atlantic Railway and was carrying a full load of lumber when it derailed on a freight siding. 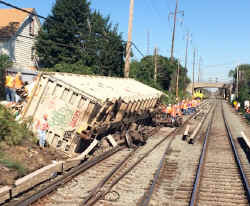 The derailed car came to rest on its side and in a location that made it impossible to re-rail without first off-loading the lumber. 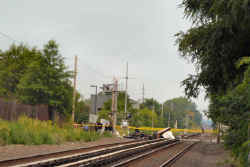 LIRR workers cut away security fencing made of high-gauge steel, enabling NY&A to bring in the machinery needed to remove the lumber Monday night. 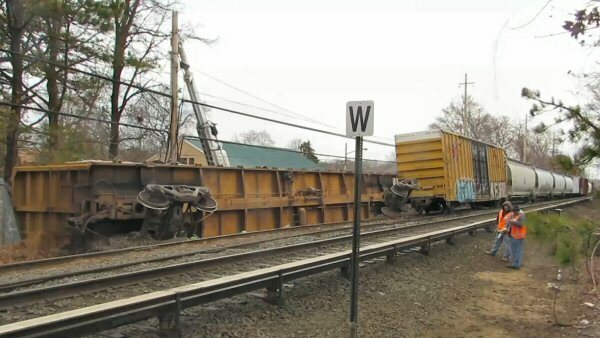 Two cars out of a 16-car freight train derailed west of Hicksville on Tuesday, officials tell Eyewitness News. The freight train is operated by New York and Atlantic. 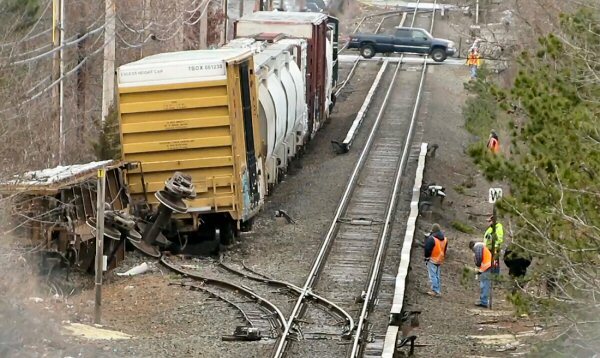 No injuries were reported. It is unclear what caused the cars carrying construction materials to derail. One track was taken out of service. Emergency crews planned to bring in a crane to remove the train from the tracks, then inspect the 100 foot section of track that was damaged.